Forests around the cottage were once peaceful and quiet place. Even now, they apparently heard only murmur of the wind in the trees. But then they realized, that they do not feel breeze on their face. The air is quiet, but rustle continues. They turned back their eyes in disbelief at the forest, still making noise. What’s going on? Answer came a few seconds later, when first one of them stepped out of the shadow. Meat was hanging from his shoulders, he had a dislocated leg and terrible glassy eyes. This view engraved in everybody’s memory. 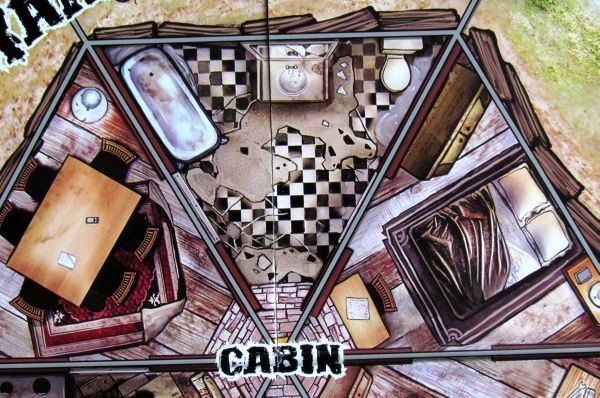 The desire to save themself was strong, but there were friends inside the cabin. Running around the house, they learned, that monsters are everywhere. They are pulling a noose around. For life they shall fight! 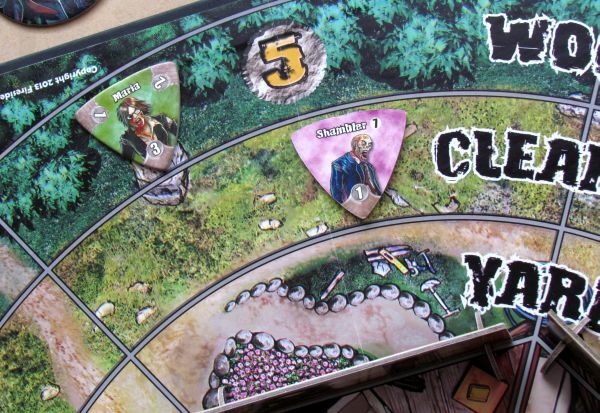 Stand up to all those undead monsters in the new board game from publishing company Fireside Games, authors of entertaining Castle Panic (review) and funny dice game Bears! (review). The first of these game shares similar mechanism. But there were many changes, that resulted in creation of this new box, designed by Justin De Witt again. 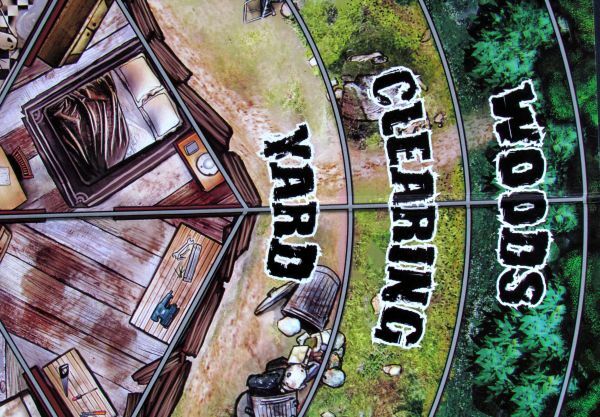 The game is called Dead Panic and name clearly gives a sense of what it is all about. 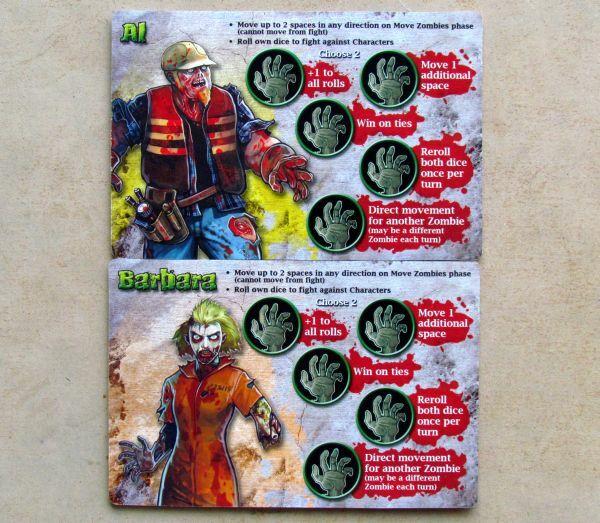 Box and its contents was presented to public in 2013 and is already looking at you with dry zombies on the cover as work of illustrator Victor Pérez Corbella. 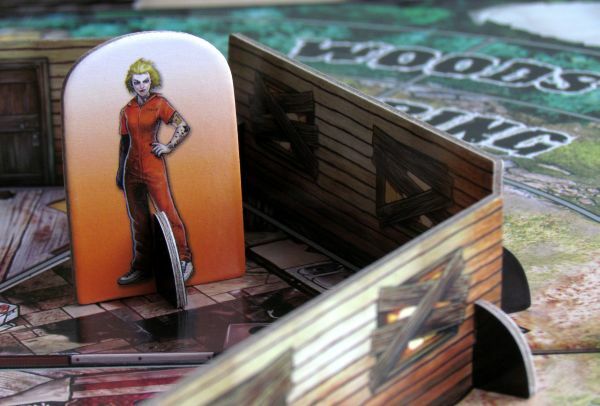 Indoors, expect a lot of components, that are well-guarded by twelve page booklet together with a large folding game board. 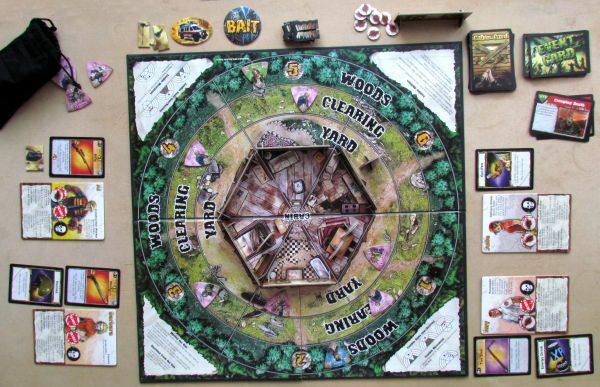 It has a picture of a cabin on it, surrounded by woods and two rings – outside one consists of trees, while between the cottage and the forest, there is an open glade. 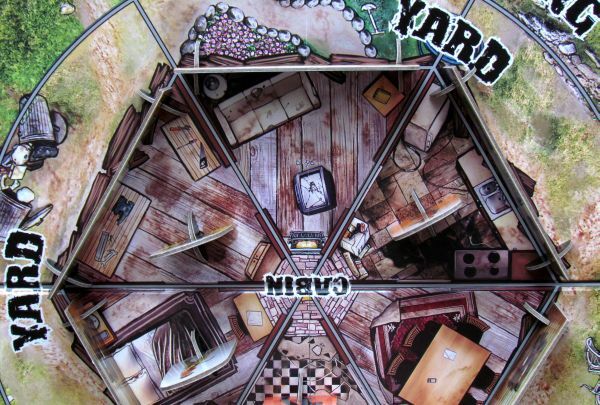 Inside awaits you a lot of cardboard components mainly represented by eight characters, which are also drawn on a small token and they need a stand, on which they will move around the board. 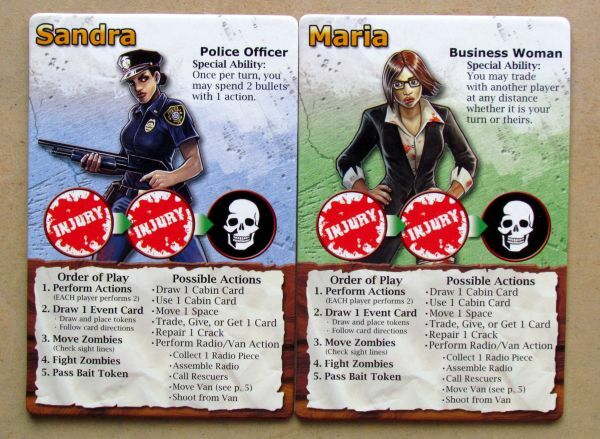 Their main card is reversible – on one side, you see classical human form of your man/woman, while the other side shows undead incarnation of the same person. 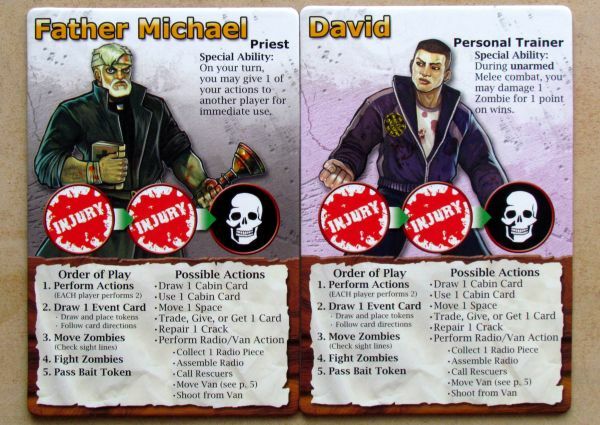 Cards contain texts describing actions of a player and spots for putting tokens of injury. Each of the heroes has some extra special skill. But these cardboards are not alone. 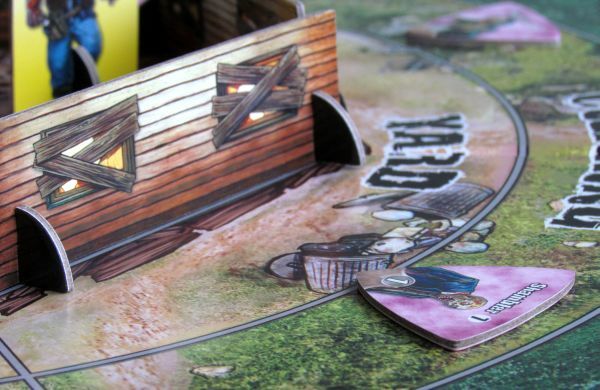 Just as in the original Castle Panic, we get simple 3D elements, that allow board to excel in visual style. 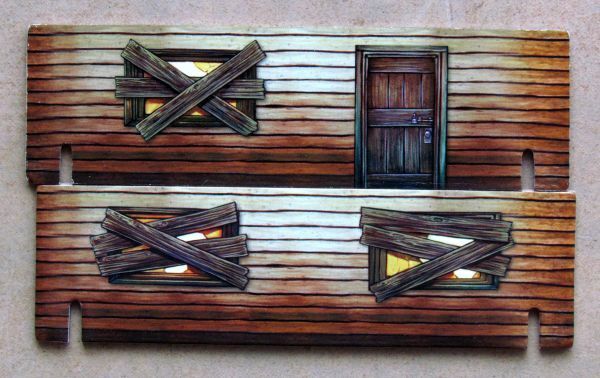 This time, they are used like cabin walls, that are put in stands and they will keep the undead from getting inside. At least for a moment. 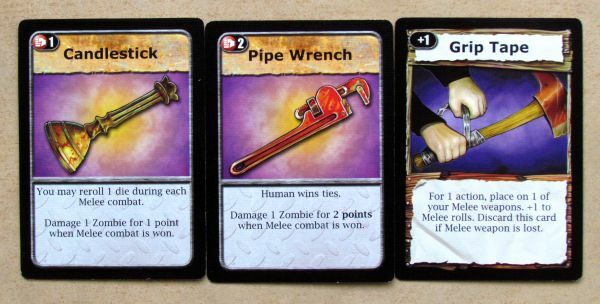 Several small tokens also include three-part puzzle of radio, that you will be trying to build. You will of course also need two decks of cards – defense equipment and events, that will summon new enemies from the forest. 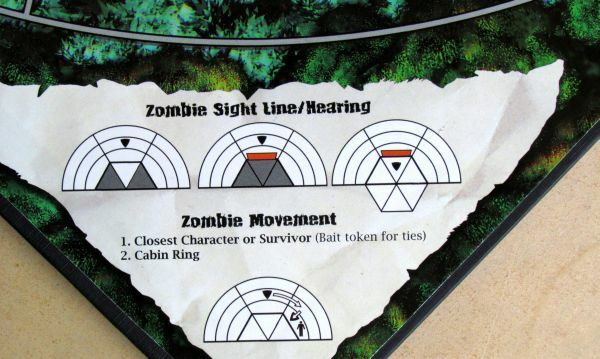 Most important, however, are triangular pieces of undead. 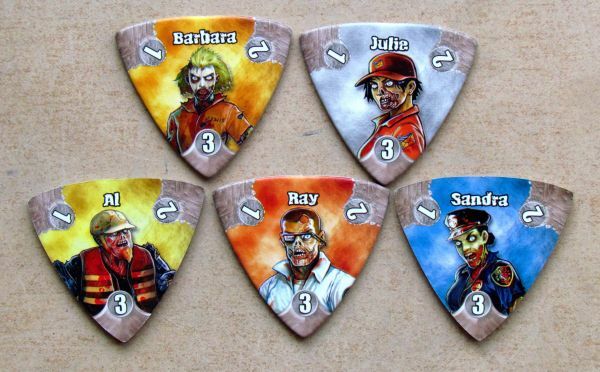 In total, there is 24 of them with different numbers of lives atop the chip (current value is indicated by rotation towards the cottage), other eight can replace your character, when they die. Last three people in the game are other survivors out of the forest, who together carry one piece of radio each and you will try to get it from them. 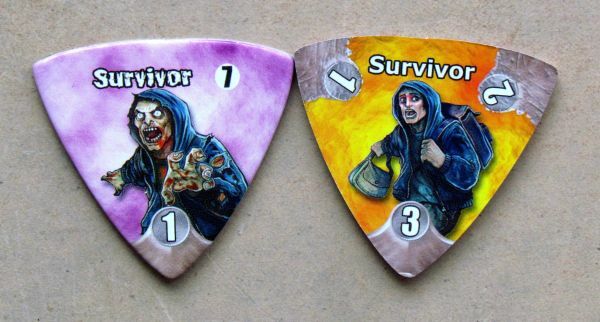 Undead and survivor tokens (with the exception of the infected heroes) are placed into a canvas bag. 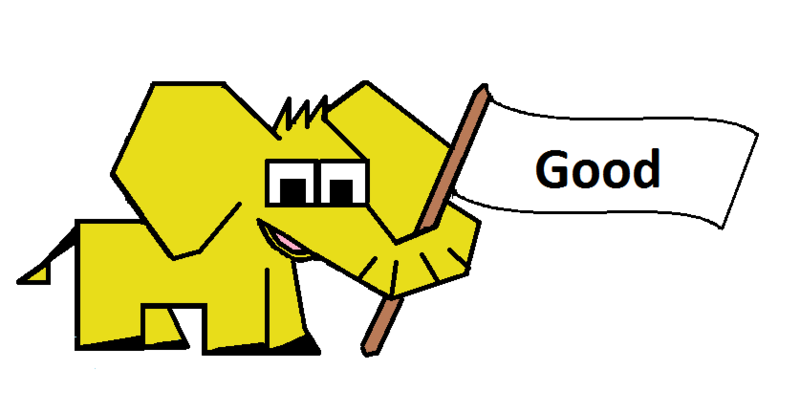 Thus we actually began preparing the game. 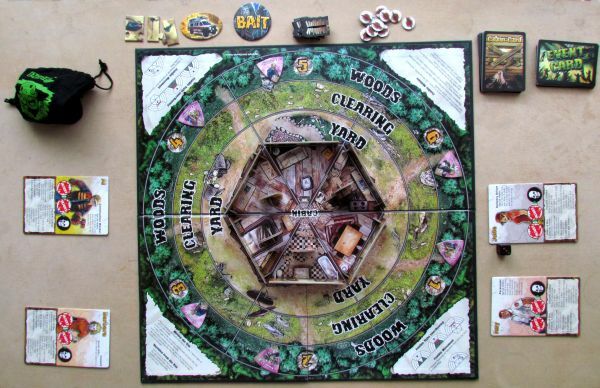 We put game board into the center of the table, each player selects his character and will put his cardboard figure into defensive position inside the cabin. 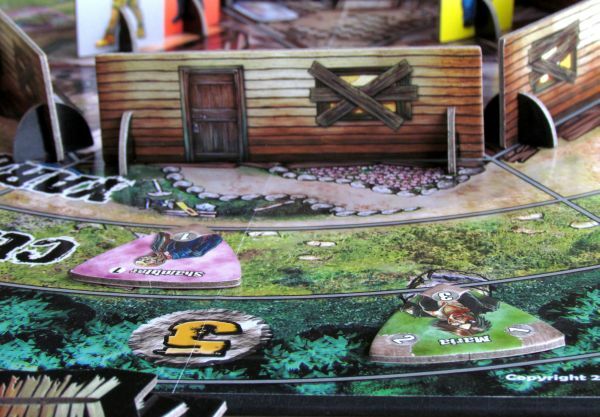 Now you need to fortify the position created by six walls (on each side of the cabin, heroes are protect by one). 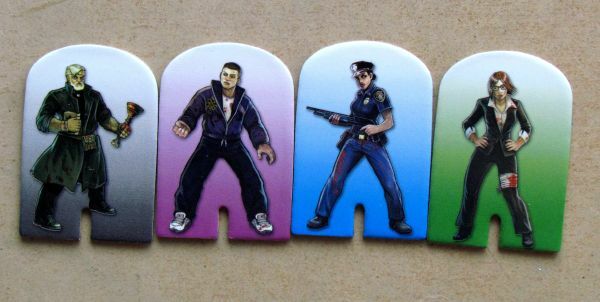 Each player puts in front himself board of selected character, participant together shuffle both decks of cards and put all remaining tokens somewhere within reach. 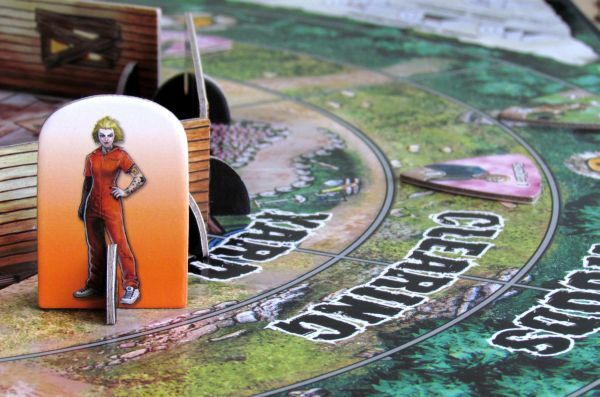 At the beginning of each round, each of the players has two action points, that can be spent freely on available actions. 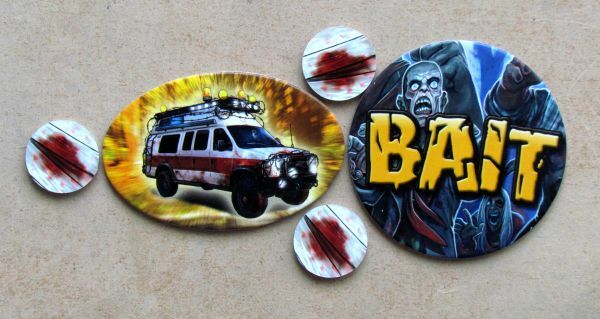 These include not only movement, but also usage of weapons to attack the zombies, searching the cabin (= for finding an equipment card), repairing a wall or assembling radio. 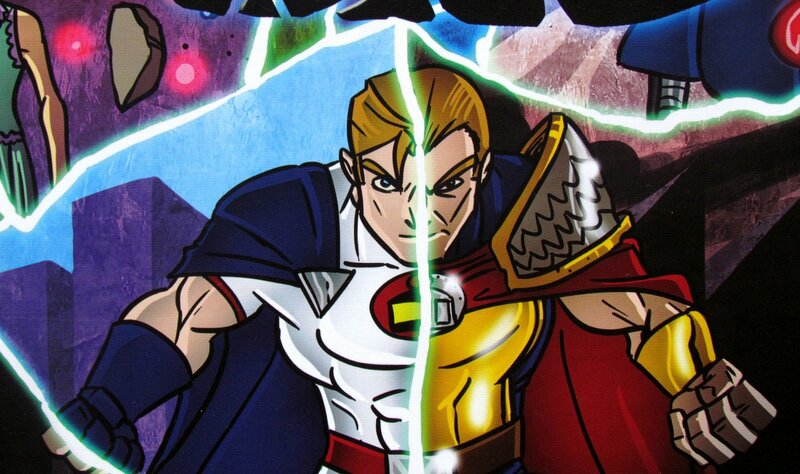 Heroes can shoot approaching monsters or stand against them in close combat. It is up to the players, what weapons they use, but their number is limited to a total of five. You cannot hold more at the same time in your hands. 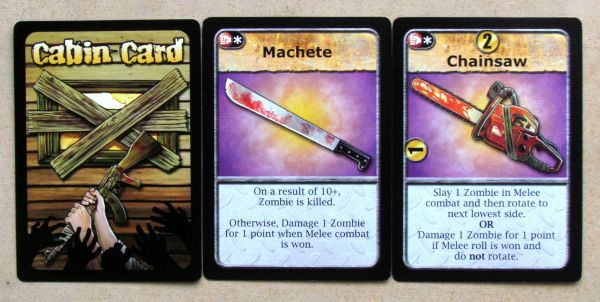 In addition, ranged weapons have a limited number of uses, which is represented by current value of their card. Shot is considered automatically as a hit and takes away enemies lives. You mark this simply by turning the triangle with the attacker, so that they face the cabin with a value of one less, than before. 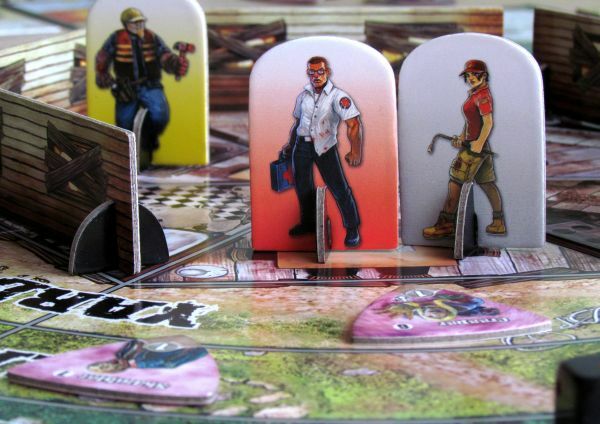 At the end of the round, player gets opportunity to fight zombies in the same position he is standing. But this time its free, without using up any action points. But first it’s time to reveal new events card, which will bring new opponents into play. Their starting position on the outdoor ring is decided by a roll of the dice. Then all zombies move forward to the nearest tasty and juicy target. Along with them, also survivors are moving. Even those may come into play together with random layout of monsters. 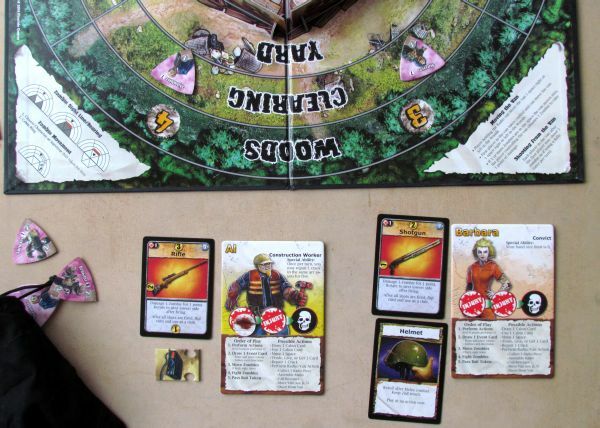 All the zombies and people will fight in close combat at the end of turn, in case they stand in the same spot on the map. Then the game continues around.. players are trying to get the radio to call for help in the shape of a van, which they can jump into. Only when all of them are safely inside, everybody can celebrate victory. 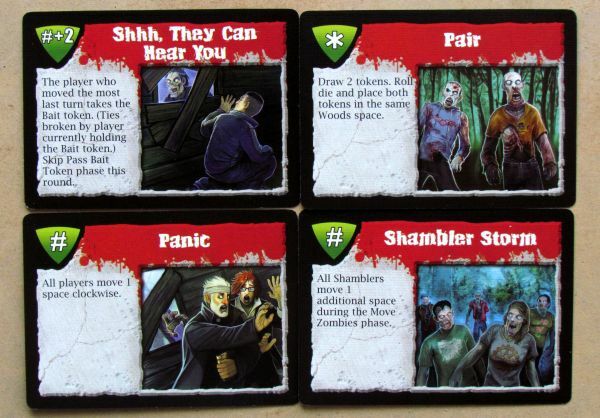 The game may end up also badly, if all participants are turned into zombies. 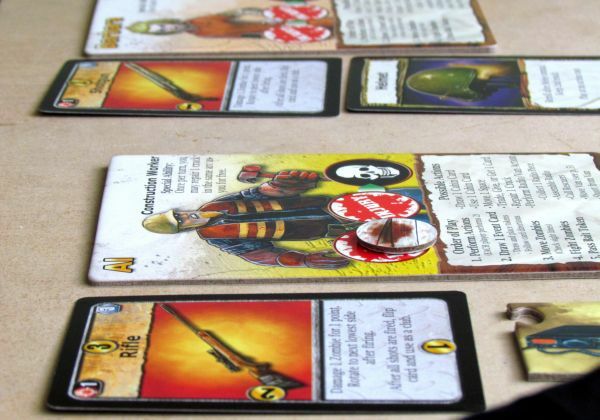 Dead Panic is another cooperative game, which brings topic of the undead to us. 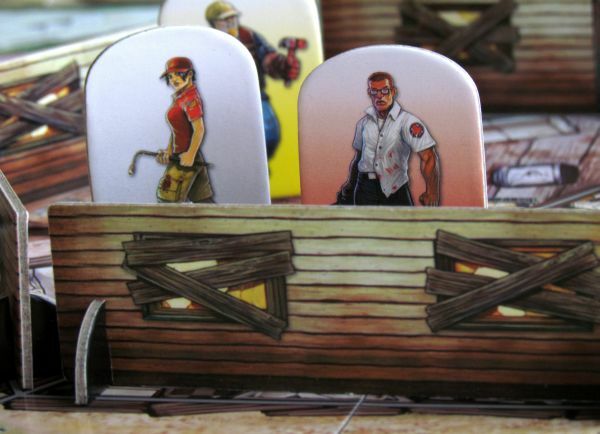 Many players can be tired from this up to now, especially when that position is now successfully controlled by miniature game Zombicide (review). It would seem, then there is no place for another game with a similar theme. 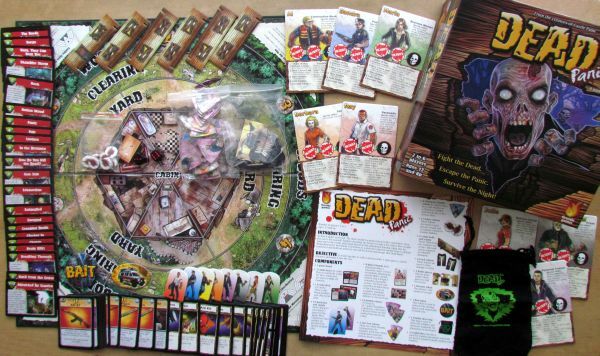 Fortunately Dead Panic is sufficiently different, that you will still be interested in playing it. On the contrary, there is not enough variability at first sight. You receive no scenarios and only one task. Previously, we would probably be content with that, but given wealth of games with monsters longing for brains, our demand shifted a little further. Fortunately, this is compensated by other ideas, but mostly gameplay, which remains unchanged from the eye-taking Castle Panic. 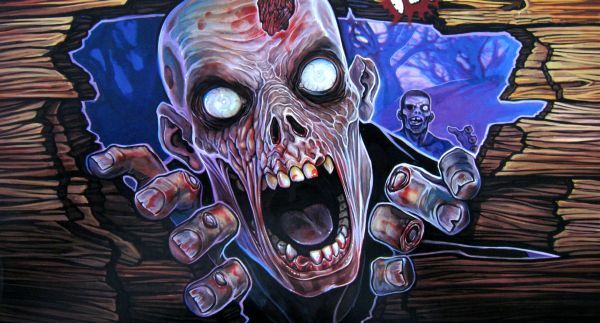 Undead are moving unstoppably towards your positions in the cabin, but this time, if they pierce through the walls, you do not suffer defeat immediately. You simply lose your valuable hideout, but you can continue to fight, until you are bitten and you’ll become just another silly zombie. The very fact, that players can switch sides during the game and thus also changing victory conditions is the biggest and best twist. There is no player elimination, who should otherwise wait for the game to end to get back into action. This victory for the wrong side, although not mentioned in the rules, does have a lot to offer. 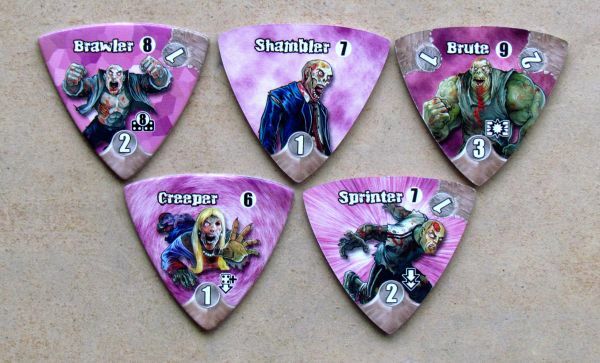 There are even four spaces for special actions for zombies, from which you get to choose two each turn. You can simultaneously use some sort of lives, after which even your headless zombie will fall to the ground more dead than before. But we are already near end of the game in this case. Game time, compared to the previous incarnation, is a little stretched and may take up to ninety minutes of your life. However, Dead Panic as such, can no longer be seen as family fun, even though recommendations from thirteen years on the box is probably an exaggeration (could be a little lower). If you do not mind the theme, then it certainly can be handled by younger children. 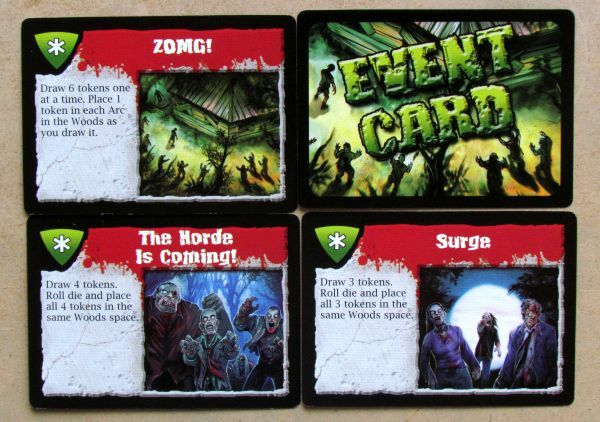 Event cards are perfectly balanced for different numbers of players and brings to the game different numbers of monsters depending on the participants. Thus, you can be sure, that you always have a chance to win. Rules are simple, maybe just fighting monsters can brought a few hiccups. Authors efforts to stay simple and easy with the battle system is to blame. Although there may be more characters from both sides on one spot at the same time, each of them can attack only once and choose the target of its attack. This is perhaps the only place, where otherwise elegant system gets a little wild. 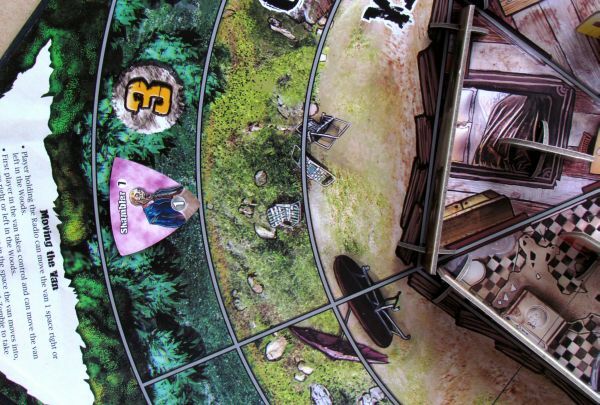 Compared to the original game of Castle Panic, Dead Panic brings a completely different experience. You have the freedom to move your character, while in the fantasy version, you were limited to the role of defenders inside the castle walls. This freedom has a positive effect and game works even better together as a whole. They changed the whole combat system, which is now more contact focused ,which is also good. 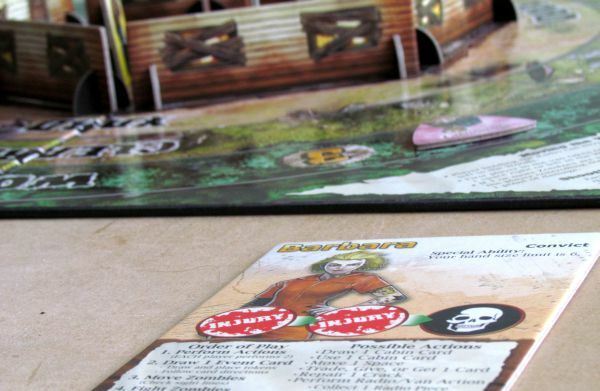 Dead Panic is a hilarious cooperative game, which again returns to the world of the undead, as we had many times before. Fortunately, it retains the lightness of gaming system, where you meet waves of enemies and you are drowning in an effort to withstand the onslaught. 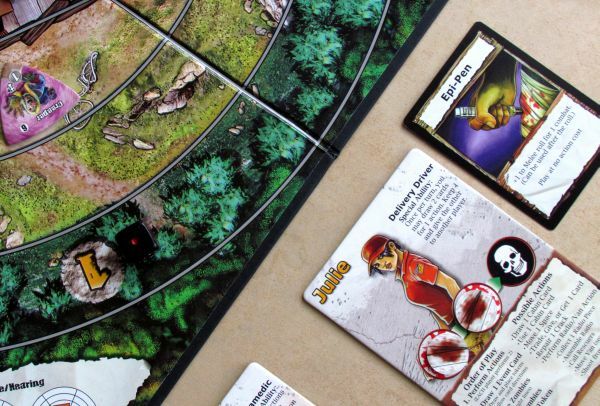 It is this pressure with the new freedom of movement and possibility of becoming a zombie, that is an attraction, justifying purchase of this game for new players and also for lovers of Castle Panic. 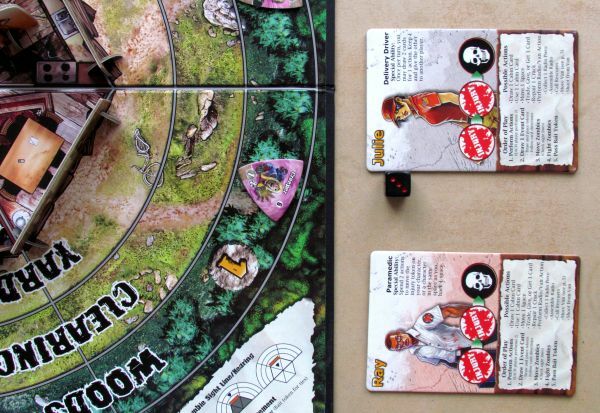 Dead Panic puts players into a cottage surrounded by a forest full of zombies. Their goal is nothing more, than to eat your flesh and brains, but you guys will definitely defend. You have weapons hidden inside the building, but you can also go out and confrontate monsters personally. Just be careful to not let them bite you, because then you can become one of them! Rules of combat are a little more complicated. Otherwise the game has simple mechanisms, that promote an atmosphere of knotting clouds, as more and more monsters are coming your way. Forest has a variety of types of enemies, that differ in speed and strength. The only way out of this mess is a radio, that you need to summon an assistance. Freedom of movement is certainly a good thing. Dead Panic eventually remains a good game, which reminds a good B-horror movies. Ninjas use all the tools to get, what they want. And what about you? 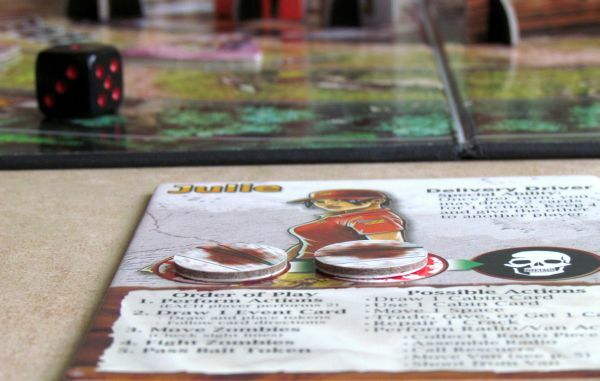 Review: Drago-Tuku – get back to the castle! Where can you hide, when chased by a dragon? It can dig anything hidden in the ground and climb trees with its claws.